Birds, Birds, and more Birds. (Also known as: owls are awesome) - Why can't we be France? Skipping around a bit - back in time to October and the University of Minnesota's Raptor Care and Management Class I was delighted to attend. Me with one of the clinic's resident peregrine falcons. A rehabilitated barred owl about to go back into the wild, ironically in the town where I live. lyosha came out to Minnesota and helped to throw more fuel under the fire of my lifelong obsession for birds by nudging me into taking the U of M's Intensive Raptor care/management workshop - something I've wanted to do since they started offering it. This gave me the perfect opportunity to go and get more of the practical experience I need with birds of prey. The centre itself is well deserving of its title as one of the world’s leading bird of prey facilities – with a fantastic staff, incredible birds, dedicated volunteers, and incredible vision. Learning to correctly wrap ball bandages to help heal damaged feet. I’m not sure if everyone realizes just how big bald eagles can be! A badly overgrown beak in need of coping (an education bird that was allowed to overgrow for purpose of demonstration). Same bird, beak nicely coped and shiny! It was amazingly easy to do compared to working with the parrots whose beaks I've trimmed for years - since the raptors don't have that muscular tongue and super beak strength of the psittacines. You have to be so much more careful of the bristles around the face, though. An amazing demonstration of the effectiveness of acupuncture on a bald eagle. It was incredible to watch the results in a bird (who obviously cannot lie about its effectiveness). It makes me curious to explore the effects of the art on myself! Learning to wrap an interdigitary bandage on a bald eagle patient. 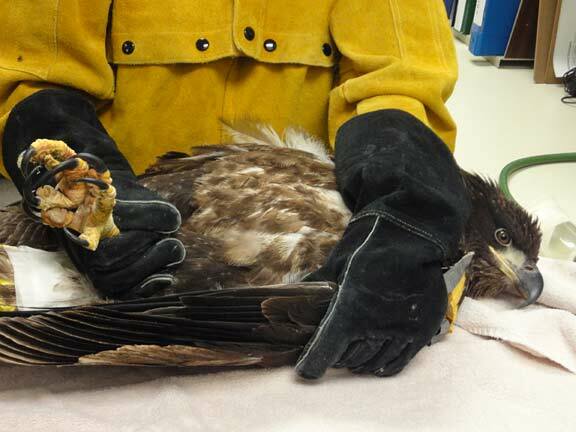 A juvenile bald eagle patient down in the clinic. The incredible, massive ear opening of a great grey owl. Eye exam on a great horned owl. This owl was amazingly calm and patient - he was one of two great horned owls the center keeps solely for the purpose of veterinary education (they are otherwise unreleasable owls but they 'earn their keep' so to speak by helping people learn how to care for raptors in general. It was obvious they had been through the drill in-numerous times before. Learning to give vital fluids. The whole experience was amazing - the class was so much more than I could have possibly imagined it would be. I learned so much and the group of people who attended were all amazing. I am planning to spend more time learning in-depth about day to day care of raptors this winter and meeting up with local falconers (in preparation of taking the state exam and finding a mentor). Eventually I will be able to trap and train my own red-tail and get my feet wet in the sport. Me too. :) It was really amazing! In general, they are a slightly different 'shape' and 'feel'-- even if you had a pure albino bald next to a pure albino golden of the same size. Thank you! I have been looking at photos of them both to try to familiarize myself more - I see what you mean with the head shape. I didn't realize golden eagles had such 'petite' heads on them! DANG, this is all so cool! I'd never have the time to go through this sort of thing, so it's absolutely fascinating seeing your photos. Anything to do with birds is life... er, time consuming, that is for sure! I am glad you like the pictures, I am sure this journal is going to become more and more bird spam over the years. Acupuncture on birds? I've never heard of that before. I had not either, and it seems to be a very novel thing - the doctor who was practicing is a human doctor and veterinarian and this was her first avian patient (and I'm guessing one of the first raptors it was ever attempted on) - but it's had great results for the birds (who were suffering from arthritis and other foot ailments). Awesome workshop! And I'm so happy to hear about someone actually in the process of getting their falconer's licence. I've been interested in falconry for 5 years now, enough to even get the 20 page info packet about it and the test and all the rest! I wish I was settled somewhere long enough to do falconry, not to mention in a country that allows it. I could be very happy just volunteering at a rehab centre and just being near the birds too. I think it's great you went to the workshop though. If I was on the path to getting my license, I'd look into doing something similar. You can't know *too much* about your bird! I'd love to hear WIP stories about your path to becoming a falconer! I love love love your icon! It's really silly falconry is not legal where you are. Here it is heavily regulated (as it should be) but the point being - 70-80% of young raptors die in their first year, so when you trap a wild birds and give it that extra year or two of good food and hunting training you can actually be helping the bird (and if nothing else aren't hurting anything). Just outright banning it, when it has such a long history in so many cultures is just crazy! I found that icon somewhere and had to nab it- I <3 Goldies! If I could do falconry, I'd want to work up to getting one! Yeah, I'm in NC right now, but I might move to Norway or Australia, which are the two places that either ban it outright (Norway) or make it so it's effectively banned (Australia bans falconry with native birds, but also bans the import of non-native birds)... So... Yeah. To my knowledge, Norway doesn't have any raptor rehab centres, but Australia does- so that'd be an option at least. I might also move to the UK, which allows falconry and falconry there is actually quite a bit bigger there than in the States. As you can see though, with all these possibilities, it's why I can't settle down and actually try falconry- who know which country I'll end up in! That horned owl is pretty cute too, in a displeased, "I'm-very-unimpressed-by-you"-manner. Thank you for sharing this. It was informative, plus what's not to love about birds? There's just something particularly special/different about them. And I, too, also love owls! Here is a relevant icon to communicate my approval. Neat! Where did you work with them? It reminds me of college - one of our lecturers was into raptors and owls and he used to do falconry. He had a wonderful collection of birds which he sometimes brought to college to fly. One of the things he did was raptor rehabiliation and part of the work he did was looking after injured wildlife and releasing them when they were better. There was this time when he brought in some baby hedgehogs that had been orphened - their skin was pink and their spines hadn't harded yet. WOW! So much coolness! I'm glad it was such a great experience and also happy you shared photos! SO AWESOME! Not necessarily of them mating, haha, but the birds themselves? i know its just the way you're holding him, but damn if that second pic doesn't look like he should be purring.. hooting?... and wanting belly rubs. :D reminds of the owls we saw in a hawking demo this summer. such amazing and stunning birds!